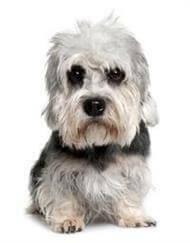 Indeed, Dandie Dinmont was in fact the name of a character in Sir Walter Scott's 1814 novel Guy Mannering, whose pack of six Pepper and Mustard Terriers were described so vividly. Sir Walter was so taken with the breed that he acquired several of them during his lifetime. In peak condition these dogs should weigh 8kg for the female and be about 20cm tall, while the males are usually 11kg and 28cm in height. The Dandie does not require extensive exercise as long as it has sufficient garden to play in and is taken for walks from time to time. While intelligent, it is not always the most obedient of dogs and will, if allowed, go about its business in a rather aloof manner. Its coat requires some trimming and grooming, primarily to remove loose and dead hair that can cause matting, but also to retain the distinctive Dandie features, such as the silky topknot and tassels. The Dandie Dinmont does not moult, so its body coat either needs to be stripped by hand or clipped approximately 2-3 times a year. Like all dogs, its toenails need trimming regularly. The Dandie is a hardy little dog, with few common ailments. However, due to having large eyes and a profuse topknot of hair, it can suffer some eye irritation if not regularly groomed and checked.